Do Have a Dux Hot Water System? Is Your Hot Water System In Need Of Repair or Replacement? The Dux Company has been in operation since 1915. Their water heaters are manufactured in Australia and are designed to work well whilst giving reliability, longevity and efficiency. 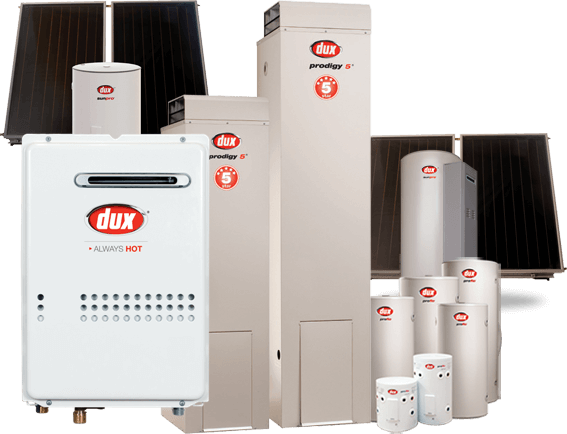 The Dux Hot Water System comes in gas, electric and solar hot water units offering a wide range in capacity and water storage. Dux are proudly Australian owned and have been manufacturing top quality hot water heaters out of their factory in Victoria since 1988. Their focus is on innovative, cost effective and highly efficient hot water systems that are perfectly suited to Australian conditions. The Dux hot water system are well known for their reliability and durability backed by 5 and 10 year cylinder warranties nationwide. If you’re looking for a high quality hot water system that has been built to last and one that is efficient and designed specifically for the Australian climate conditions then you can’t go past an Dux. Dux have proven themselves in providing a competitive hot water system and have won many industry awards over the years for their superior quality and efficiency. With many models in their range of stainless steel storage hot water systems, Dux is the perfect hot water system for you home or business. Which Dux Hot Water System Is Right For You? The cylinder is made of welded steel and protected by a strong color bond casing that enhances its performance. Dux back this with a 5 year warranty on the cylinder. The Dux Hot Water System are solar compatible and an Dux solar kit is available for easy conversion. If Dux hot water system is the hot water unit you would like to know more about, or to receive expert advice and a free, no obligation quote on the ideal hot water system for your home or business then call the hot water specialists from Inner City Plumbing. When you need a 24 hour plumber Melbourne to fix your Dux Hot Water System, you want to be sure that the Melbourne emergency plumber you are calling will be available. Inner City Plumbing know how to deal with a hot water emergency and will not let you down. We have over 20 years of experience in taking care of hot water and plumbing emergencies. We know how to diagnose a problem quickly. Our 24 hour plumber Melbourne has the experience to take care of your problem quickly. We guarantee that we will have a 24 hour plumber Melbourne at your location within 60 minutes to keep you hot water flowing. With us, you will not be getting a phone call from a lost 24 hour plumber Melbourne asking you for directions. We are your local Dux Hot Water System professional. That is why we make sure that every 24 hour emergency plumber we send out is fully equipped with just about everything they need. Dux Hot Water System	Overall rating:	4.6	out of 5 based on 117	reviews.